Franklin Mint dolls are exquisitely crafted dolls from some of the top doll designers. 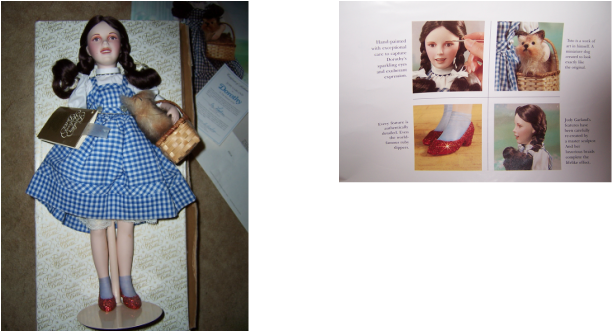 Our Franklin Mint Heirloom Porcelain doll is Dorothy from the 1939 classic movie "Wizard of Oz." "Dorothy" was portrayed by the famous singer and actress Judy Garland. Our Dorothy doll is 42 cm tall, and looks just like the character Dorothy in the movie. She has her hair in plaits (braids), wears a blue and white cotton gingham pinafore dress, long white pantaloons, and has sparkling red ruby shoes on her feet with blue painted socks. Toto the little terrier doll is sitting in her wicker basket which she carries. She comes with her doll stand, C.O.A, hang tags, letter, pictures, and her box. Cinderella is a Franklin Mint porcelain fairy tale doll and is just exquisite. She was designed by Gerda Neubacher, and was crafted in hand painted bisque porcelain. Her face is gorgeous as well. She has blue open painted eyes which have painted upper eyelashes, painted eyebrows, lovely blush on both cheeks and closed red mouth. She has a porcelain head and neck, 3/4 porcelain arms, 1/2 porcelain legs and a stuffed fabric body. ''It is made of satin organza and gold lame. On her feet are glass slippers (shoes). Around her neck is a necklace electroplated with genuine 24 karat gold and lustrous faux pearls. On her head is a beautiful tiara which is set with 3 faux pearls and a sing one half point diamond''. She does not come with her original box or COA, or stand. CINDERELLA IS A GORGEOUS DOLL SOLD EXCLUSIVELY FROM FRANKLIN HEIRLOOM DOLLS IN 1987. The Gibson Girl (mother) with baby are Franklin Mint dolls and are just exquisitely dressed and so beautiful looking. They were handcrafted by Maryse Nicole in 1986. They were authorized and authenticated by Dana Gibson great-granddaughter of Charles Dana Gibson, creator of the original Gibson Girl. She wears an authentic turn of the century gown of soft pink jacquard and chiffon, adorned with lace, satin ribbon roses and strands of faux pearls on the dress. Underneath the dress she wears long white satin pantaloons. The baby wears a gorgeous Christening gown of delicate ivory lace and trimmed with satin ribbons with a matching bonnet. It also has a small delicate plastic rattle with a pink ball on one end and a blue ball on the other end. They come with their original paper booklets and hangtags. They do not come with their original box or COA, but has their original white metal stand. 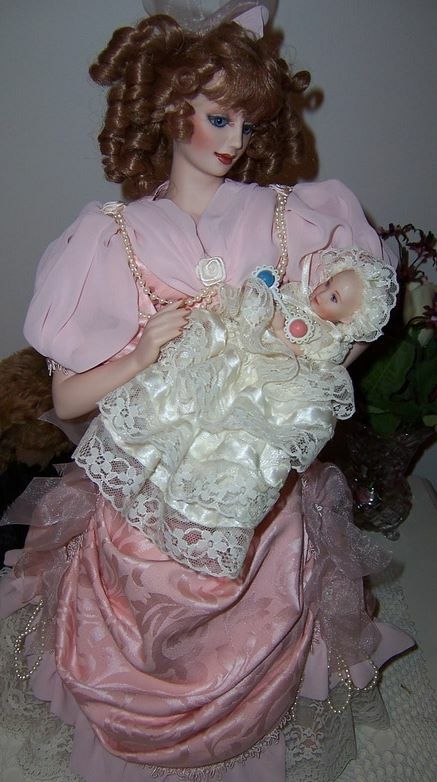 The Gibson Girl Mother and Child are gorgeous dolls which were sold exclusively from Franklin Heirloom Dolls in 1986.